Scientists are building a giant radio telescope, one hundred times more powerful than the strongest in the world at the moment. 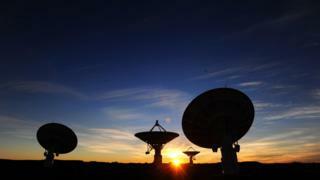 It's called the Square Kilometre Array (SKA) and is one of the biggest scientific projects in history. When the telescope is finished it'll see further into the cosmos than ever before, to help us discover new galaxies and maybe even find alien life. It's a project that could change what we understand about our Universe and life as we know it, forever! What is the SKA project? The telescope is being built by some of the world's top scientists and engineers with the help of 10 countries, including the UK. SKA won't be one massive telescope, it'll be made up of thousands of dishes and up to a million antennae, clustered together over a square kilometre. That's about the size of 200 football pitches, which will allow scientists to monitor the sky in detail. They're being built in South Africa's Karoo region and Australia's Murchison Shire, two of the most remote places on Earth. These desert locations are radio quiet zones, because few people live there, which make them perfect for radio telescopes. Unlike an optical telescope, which is a simple piece of glass that makes far away objects appear closer, a radio telescope detects radio waves coming from space. Radio waves are a special type of light that the human eye can't see. They can be found coming from clouds of gas where stars are born, as well as the centres of galaxies. So a radio telescope doesn't see the stars - but instead sees the gas between the stars that produces radio waves. They can be used in bad weather because the radio waves aren't blocked by clouds as they pass through the atmosphere. Radio telescopes can also be used in the daytime as well as at night. The biggest dish on a radio telescope acts like a massive mirror, which reflects radio waves to a smaller mirror, this then reflects the information to a special receiver. The information from the receiver is then processed and organised by a powerful computer, which creates colour images that we can see. All that information needs to be organised by a super computer, which will be built in the UK. At the moment, we've only seen one pixel of space - SKA will see more of the complete picture. It will look at how the very first stars and galaxies formed just after the Big Bang. Scientists also hope it will help them learn more about dark matter and magnetic fields in space, things we know very little about. And they will use information gathered by SKA to try and answer a huge question… Are we the only intelligent beings in the Universe? 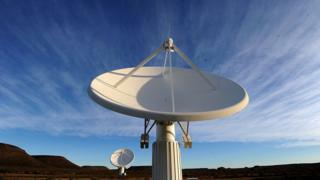 How do you control a radio telescope? Radio telescopes don't stay in one position, they're moved regularly to map the skies, but controlling them isn't an easy job. SKA's Tiyani Baloyi shows Ayshah how to control a radio telescope?